Clearly Clean Products, LLC, September 12th, officially launched its Roll Over-Wrap tray line as it has received multiple comprehensive patents, making it the WORLD'S ONLY patented 100% recyclable, smooth-edge overwrap tray line for packaging. This tray features a proprietary, patented rolled edge that provides a smooth surface for overwrap ﬁlm, mitigating leakers during production and transportation. According to the Connecticut-based company, numerous citywide and U.S.-wide bans on polystyrene ("Styrofoam"-type foamed plastics) - combined with consumer pressure and corporate commitment -- are fueling the demand for eco-friendly packaging and accelerating the sustainability timelines of many organizations. Clearly Clean's trays utilize PET, the same material used in recyclable water bottles, finally bringing a 100% recyclable, smooth-edge overwrap tray option to grocery stores, food processors, and packaging distributors. 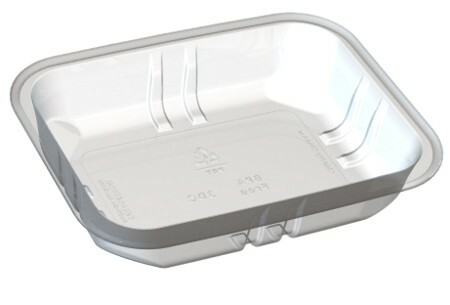 • Reduce product loss and increase customer satisfaction: Due to its rolled edge, this tray is three times stronger than polystyrene; therefore, unlike polystyrene, it will not break during transportation nor will it bow tie due to weak walls, significantly reducing shrink and maximizing customer satisfaction. It can also withstand high-speed processors without a loss in structural strength and can be reworked again and again if there is a film or meat styling issue. • Make a quick and easy change from polystyrene: This rolled edge tray can immediately replace all plastic and foam trays on high-speed packaging machinery; there is no need to change equipment. • Maximize shelf appeal and make the product the center of attention: The look of the PET tray will stand out from the competition. In addition, the tray comes in multiple colors, including crystal clear. The latter option allows the product to be the star of the tray and enables it to be examined from all angles. Clearly Clean's Roll Over-Wrap tray can be utilized for meat, poultry, seafood, deli, and produce - and customized in terms of size, thickness, shape, and colour. "Multiple big-name companies are already realizing the benefits of our products," said Jeff Maguire, managing partner of Clearly Clean. "We are proud to be able to help companies extend their sustainability focus to include packaging." The Roll Over-Wrap tray joins Clearly Clean's existing line of recyclable Modified Atmosphere Packaging (MAP) trays for meat, poultry, entrées, and kebobs. "The strong demand that our rapidly growing company is seeing for our trays is highly encouraging - not only for Clearly Clean, but also for the environment as foam trays take at least 500 years to decompose," said Millard Wallace, managing partner and the product's inventor. "We are committed to sustainable packaging and look forward to additional product launches as we continue to expand our green product lines."